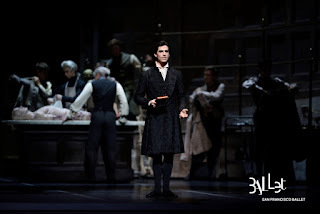 Dance Commentary by Heather Desaulniers: San Francisco Ballet - "Frankenstein"
San Francisco Ballet - "Frankenstein"
Searching for connection and companionship. Curiosity about ‘more’. What does it mean to be alive? The porous space between human and spiritual realms. Obsession. Power. Loss. Love. These themes, from Mary Shelley’s brilliant novel “Frankenstein”, are aptly mirrored in Liam Scarlett’s ballet of the same name, currently running through the end of this month at San Francisco Ballet. A co-production with The Royal Ballet, this new full-length narrative work received its world premiere last year in London, and its San Francisco Ballet premiere just last week. A new narrative ballet is an exciting prospect, and in anticipation of seeing it for the first time, I read Shelley’s book, finishing it just the day before the performance. And I’m very glad I did. Because of that reading, the plot made sense, as did the character relationships and the larger narrative fibers. I didn’t have to search or rush through the synopsis trying to figure out what was going on. The program notes share that Scarlett’s Frankenstein is “inspired” by Shelley’s source material. And that is accurate, to be sure. The ballet holds true to the general arc, but there are differences as well. Some parts are omitted or changed, some characterizations altered and some of the transitions are a little abrupt, but as this is a three-Act ballet and not an entire literary tome, Scarlett handled the adaptation of the story well. Gorgeous, yet ominous scrim and screen designs casted a foreboding atmosphere (scenes/costumes by John Macfarlane, lights by David Finn and projection by Finn Ross) as the very first notes of Lowell Liebermann’s score sang through the space. Amidst lightning and heavy rains, we first meet Victor, Elizabeth, who had been adopted by the Frankenstein family, and Justine, the housekeeper’s daughter, as children. Quickly the children grow up and the household seems replete with joy. A perfect context for Victor (Joseph Walsh) and Elizabeth (Frances Chung) to share the first of three main pas de deuxs. This first duet is full of hope and light; its youthful abandon shining through sweeping lifts, swirling turns and quick promenades in demi-pointe. Ending with an accepted marriage proposal, all is well and the entire family rejoices, including Caroline, Victor's very pregnant mother. But darkness underscores the moment. Caroline goes into distress and dies in childbirth. And we see Justine (Sasha De Sola) staring at Caroline’s locket, an item that later will damn her. The fragility of human existence has taken over the Frankenstein family and heartbroken, Victor departs to Ingolstadt University. choreographic gem in this segment of the ballet. Together, the students dance a mostly unison variation, which Scarlett infused with an appropriately academic approach, really the textbook version of his chosen steps. And the unison vocabulary in the phrase also spoke to the students’ common pursuit and camaraderie. We follow them into a rowdy and tempestuous tavern, which doesn’t distract Victor for a second – he is so enthralled with his studies. In the Act’s final scene, Victor is back in the anatomy theatre, where he creates The Creature. In a dynamic and lengthy solo, Walsh was able to track Victor’s complicated human journey. From outward movements – turns ending in arabesque, soaring battements and circular rond de jambs - he demonstrated how Victor was searching for something. Perhaps knowledge, control or solace from the tragedy of his mother’s death – maybe even a little of all three. And then there is a dramatic shift. Once he succeeds in bringing The Creature into being, he is suddenly at odds with and in dismay over what he has done. Walsh was phenomenal in these closing moments, though I wonder if one of the many group scenes could have been edited or even sacrificed to allow more time for this potent transformation. After a brief Prologue, Act II opened with a sweet and playful scene between Justine and Victor’s younger brother William (Max Behrman-Rosenberg). As William’s birthday celebration is about to unfold, Victor is suspicious, distracted and cautious. Cue his betrothed Elizabeth to try and bring him back to the moment. With swirling motifs and cantilevered turns from their first duet, she tries to remind him of an earlier time in this, their second pas de deux. And her efforts seem to be successful, at least for the most part, though Victor is periodically drawn back to his despondent thoughts. Then, The Creature (Vitor Luiz) arrives at the family’s estate. Alone onstage in front of the Frankenstein home, his first solo is broad and vast in scope. There is both a longing for connection and acceptance as well as an anger of being isolated and alone. Luiz danced beautifully, and the crowd erupted in cheers at the end of his solo. Though, for me, the choreography was a little curious; The Creature aspect of the character getting lost in the overly stylistic steps. Death and destruction marks the end of Act II, with The Creature killing William, and after the locket from the beginning is found in her possession, Justine is accused and put to death. Act III of Frankenstein begins in a very typical story ballet fashion, with a ballroom scene, in this case the wedding banquet for Victor and Elizabeth. Glittery adorned couples cascaded through the space with pas de basques, balancés en tournant and waltzy lifts. All this grandeur was led by Henry, a truly effervescent and charming portrayal by Greco. As the ball continues, The Creature appears for short phrases, dancing with the guests and then like a ghost, disappearing into the crowd. This game of cat-and-mouse thoroughly tortures Victor, and you could see and feel from Walsh’s superior acting that Victor was struggling with reality and the caverns of his imagination. Was he really seeing The Creature? In the last vignettes of Scarlett’s Frankenstein, a number of stunning pas de deuxs evolve. The first between Victor and Elizabeth, on this, the occasion of their wedding. A maturity of movement was evident now between the two, having traversed a significant number of years and life-changing events together. The dance was peppered with visions of those who Victor believed had perished because of his actions and choices, and so, it was also palpable during the duet that for Victor, complete happiness would always elude him. The Creature dances a diabolical and frightening duet with Elizabeth, which ends in tragedy; after which we see The Creature staring at his hands with disgust in the same way that Victor did at the close of Act I. And the last duet finds The Creature and Victor battling with a physicality of frenzy, mania and compulsion. How does the clash between these two entities ultimately end? Is it the same as Shelley’s book? Or a different twist? You’ll have to go and see San Francisco Ballet in Scarlett’s Frankenstein to find out. Desaulnier's analysis is spot on.